"The New York Department of Environmental Protection installed a prototype "algal turf scrubber" at once of its wastewater treatment plants in Queens. The scrubber--two 350-foot metal ramps coated with algae that grows naturally--is designed to use algae to remove nutrients and boost dissolved oxygen in the water that passes through it. John McLaughlin, Director of Ecological Services for the New York City Department of Environmental Protection (DEP), and Peter May, restoration ecologist for Biohabitats, explain how the scrubber works, and where the harvested algae goes." chlorophyll -- The greatest amount of the green pigment, representing floating microscopic plants in the sea known as phytoplankton, was found about 30 meters below the sea surface. (That's where oceanographers expect the most chlorophyll. Perhaps phytoplankton living at that depth must produce more chlorophyll in order to capture the lower light intensities, just like leaves are usually darker green if they're growing on a land plant in the shade). 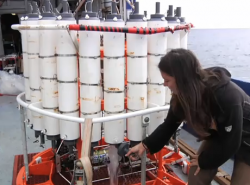 However, a surprise awaited oceanographers at 60 meters. At that depth, they discovered an unusual “secondary, deeper chlorophyll max," something not seen many other places in the world. Oxygen -- This gas enters the ocean primarily at the surface, from the air and also from phytoplankton photosynthesis. Bacteria and other heterotrophs consume the O2 as they metabolize. Therefore, oxygen is expected to decrease with depth. 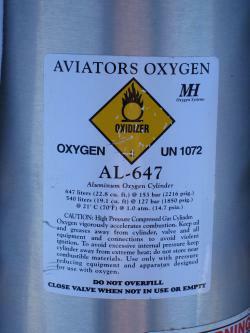 At BiG RAPA's Station 1 oxygen not only fell; it fell all the way to near zero. Dr. Angel White and the CTDCourtesy Eric Grabowski, C-MORE"Sea It Live" in some BiG RAPA videos. Join Dr. Angel White from Oregon State University as she demonstrates the CTD rosette. Then join Dr. Repeta for his Chief Scientist Station 1 Update . *Educational resource = C-MORE Science Kit Ocean Conveyor Belt's Powerpoint, "Lesson 3: Using Data to Explore Ocean Processes "
Old air: We're used to seeing oxygen in tanks like this, but some 2.5 billion years ago it was locked up in the Earth's rocks. New studies show that the element is 50 to 100 million years older than previously thought. (Flickr photo by jzawodn)Did you know that we can trace the origins of an important element in our air in today’s rocks? The current issue of the journal Science is reporting that a rock formation recently found in Australia is turning back the origination date of oxygen on Earth. The new data shows that oxygen was on the planet about 50 to 100 million years before previously thought. It’s not a huge time difference when you consider the previous early indications of oxygen date back 2.3 billion to 2.4 billion years ago. That’s the time range that researchers like to call the "Great Oxidation Event," and believe me, you wouldn’t have wanted to be around then. Earth’s air was composed primarily of methane and ammonia at that time. The origins of the "Great Oxidation Event" aren’t understood yet, but that was the start of the process that has led to 21percent of our atmosphere being made up of oxygen. And of course, without oxygen living beings like us wouldn’t be able to breath. The rock core found in Australia is a 3,000-foot-long chunk found in western Australia. The new discovery fuels further speculation that there are strong links between changes in the Earth’s geology and its biology, researchers say. That’s the big question that researchers have to delve into next. Hold the CPR: What actually happens when we die? 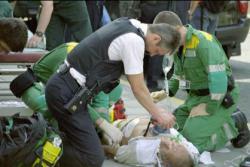 Rethinking CPR: New research is questioning if CPR does more harm than good. The thinking is that a sudden surge of oxygen into the body kills cells faster than a gradual return to normal conditions.The conventional wisdom has been that when someone has a heart attack or other catastrophic health problem, the quick revival of blood flow and breathing will return them to life. Now, new research is questioning that conventional wisdom, and is even wondering if the process of CPR (cardiopulmonary resuscitation) could actually be leading to a quicker death. Hold on to your hat and read on. The old thinking was that cells of the body would begin to die within four or five minutes of the stoppage of oxygen and nutrients coming to them through blood. The quicker a heart can be restarted and breathing can begin, the better the chances were for a body to go on living. Researchers at the University of Pennsylvania have been studying heart cells under microscopes. What they’ve found throws all that stuff up into the air. What they found was that cells cut off from their lifeline of blood died hours later, not minutes. Now here’s the real freaky part. The researchers think that the cells die faster when their oxygen supply is quickly returned. So the quick surge of oxygen and energy into the body may be just the wrong thing do to someone whose breathing and blood flow have stopped. These researchers are thinking that hypothermia – extreme cold temperatures bringing the body’s core temperature to 33 degrees C – might be a better option. Then medical professionals would have time to adjust the blood chemistry for a safe, gradual return of oxygen and nutrients to the cells, keeping them alive. University of California researchers have tried a slightly different approach of treatment at four hospitals. Cardiac patients received a blood infusion that would keep their hearts in a state of suspended animation. They were on a heart-lung device to maintain blood flow to the brain until the heart could be slowly restarted. The tests were conducted in just 34 patients, but 80 percent were discharged from a hospital okay. Under the old methods, the survival rate is 15 percent. A lot more research has to be done, but the findings do shake up what we’ve traditionally thought about how to keep people living. Share your thoughts on this topic with other Science Buzz readers here. Cheating with chemistry in NASCAR - What's an oxygenate? 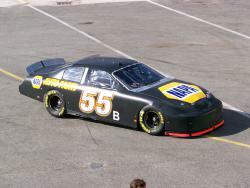 Michael Waltrip's car: Courtesy stevejk. Michael Waltrip's NASCAR team was heavily fined this week for cheating. Inspectors found an unspecified substance in the engine which was thought to unfairly boost his car's performance. But what was this mysterious stuff? Most sources say inspectors found oxygenate in the engine's intake manifold. So if that's the case how does this stuff work? Gasoline and air get mixed together inside a small chamber called a cylinder. A piston shrinks the size of this valve compressing the gasoline and air. A spark plug makes a tiny electric spark which ignites the gasoline and air causing the piston to move. The piston's movement is linked to the wheels, causing them to turn. The piston also comes back around another time to force out the gases left over after the explosion. That's the exhaust that that comes out your tail pipe. The air that gets sucked into the engine just comes from the outside world. The same air we breath. The explosion works because our air has about 21% oxygen in it and oxygen really likes to burn. But what if we could add more oxygen to this equation? This results in a more complete combustion of the fuel and more power. More power means more speed. From what I've read on the web it seems that Waltrip's team was using a type of gel that sits in the air intake on the engine. As the gel evaporated it would release oxygen into the engine which would then be used for combustion, increasing power. NASCAR was none to happy about this and fined the crew chief of the team, David Hyder, $100,000 and kicked him out of the garage. Incidentally you might be using another type of oxygenate in your car right now, ethanol. Ethanol is mixed in with gasoline to reduce emissions because it is an oxygenate. When you get a more complete combustion with added oxygen you also get less exhaust and less harmful emissions. I still think that Ethanol is a poor alternative fuel strategy but that's another story for another time. Scientists at Rutgers University in New Jersey have discovered that the amount of oxygen in the Earth's atmosphere has more than doubled over the last 205 million years. By studying samples of seafloor material going back millions of years, they determined that the atmosphere was only 10% oxygen during the time of the dinosaurs. It rose as high as 23% by 40 million years ago. (The air is 21% oxygen today.) That's about the time that really large mammals, like elephants and rhinos, started to emerge. Oxygen levels may have affected the evolution of mammals. These warm-blooded creatures need three to six times as much oxygen as a reptile of the same size. The lack of oxygen may have prevented them from growing very large. But as oxygen levels increased, mammals could start getting bigger.